Book your vacation for the period from 25 May 2019 to 24 August 2019 and save the 10 % (minimum 7 nights). 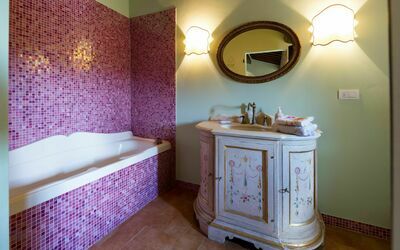 In the heart of the tranquil Tuscan countryside, bounded by olive trees and woods, lies this beautiful villa overlooking the Trasimeno Lake. 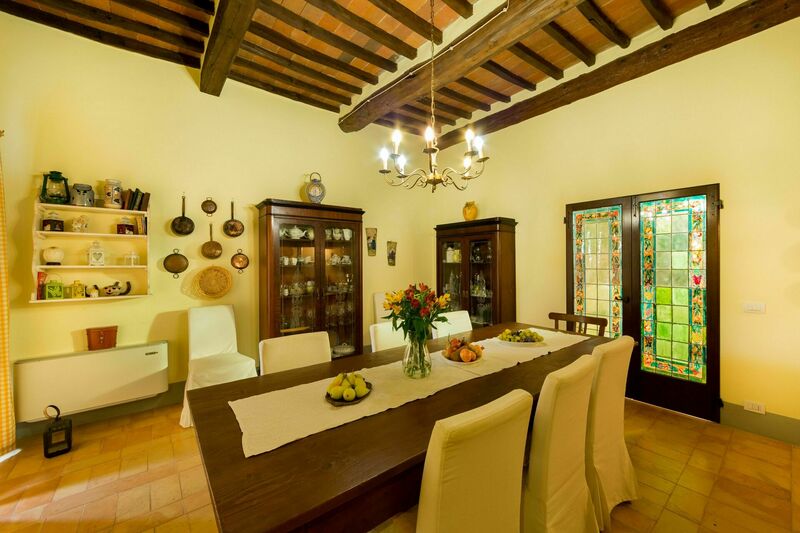 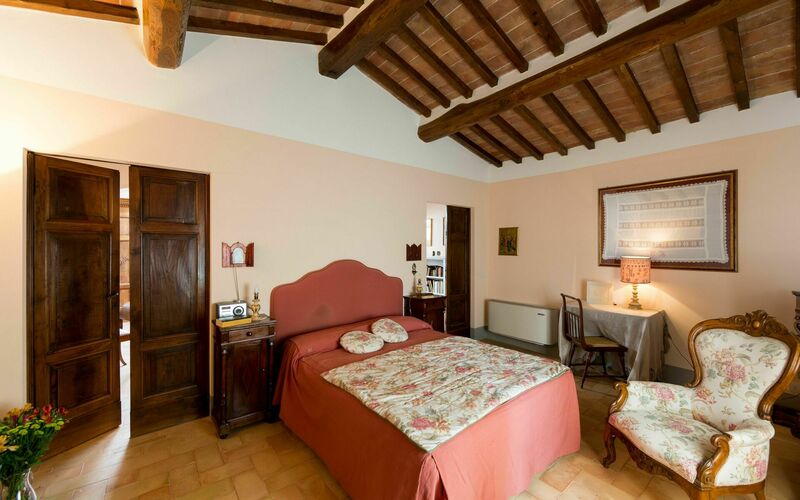 This property consists of 3 independent units, which together can host up to 10 people. 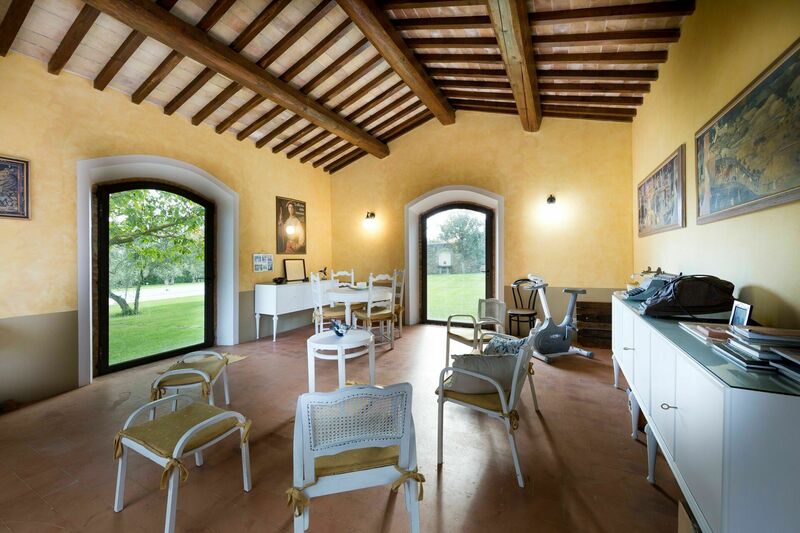 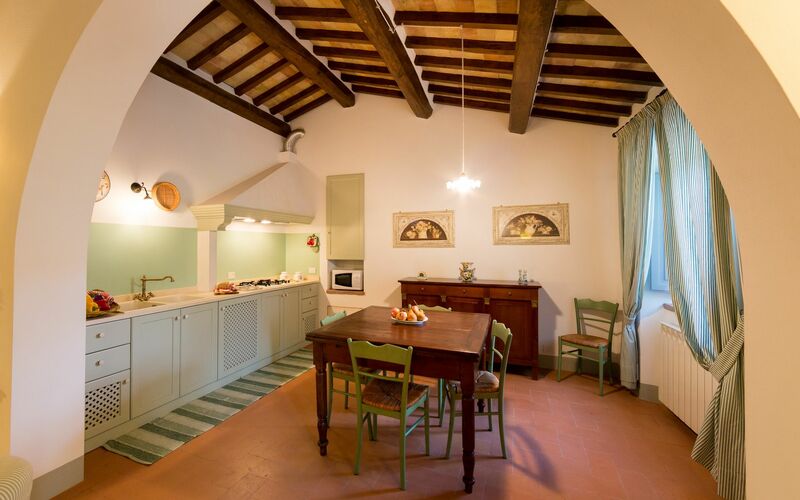 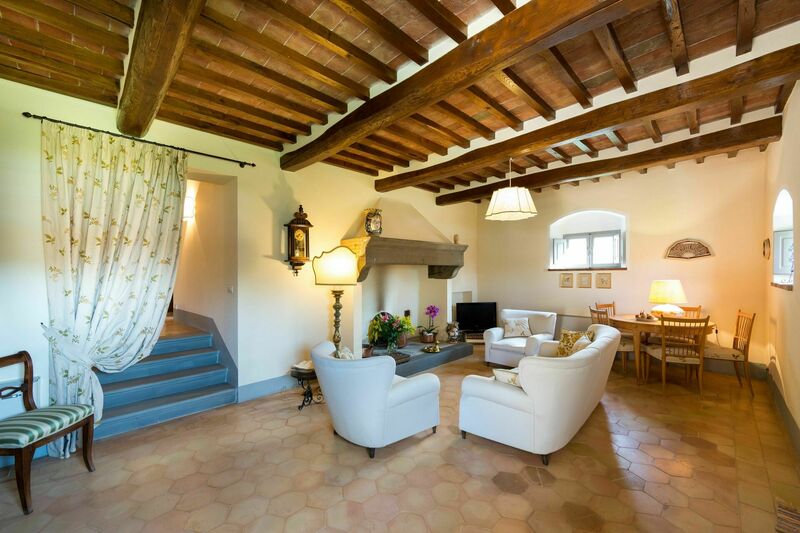 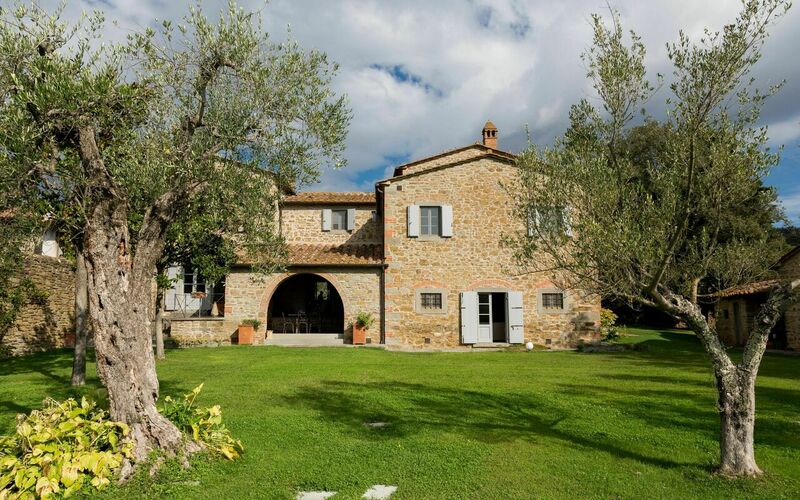 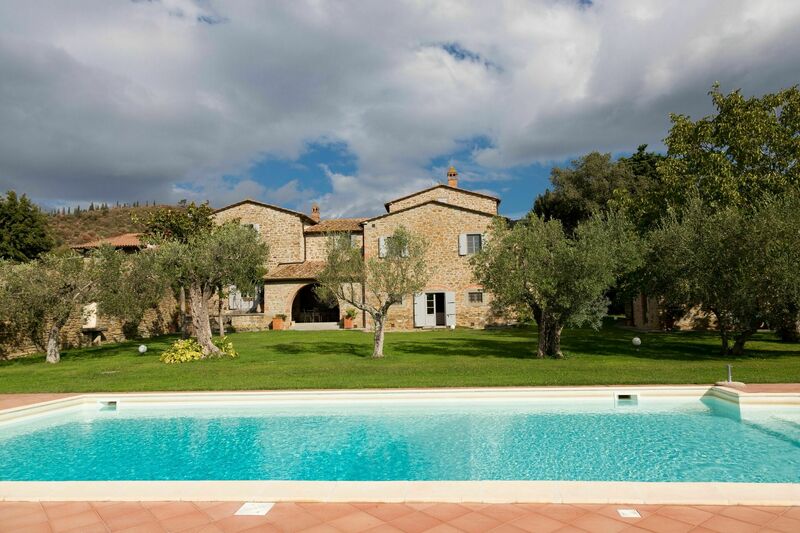 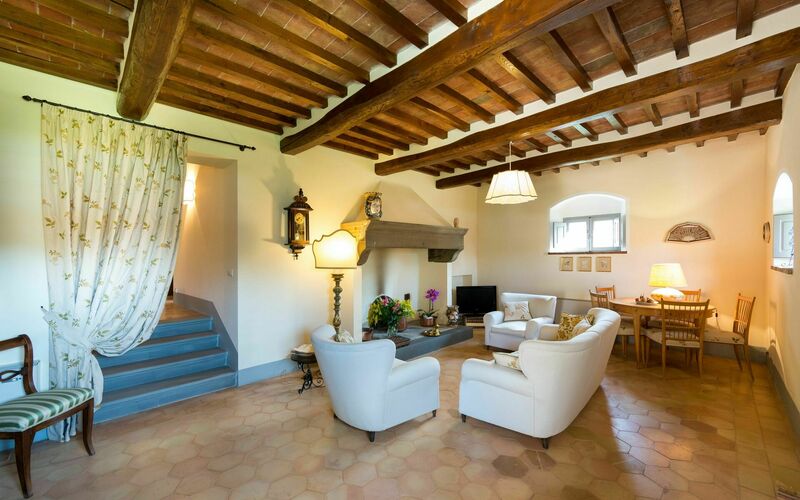 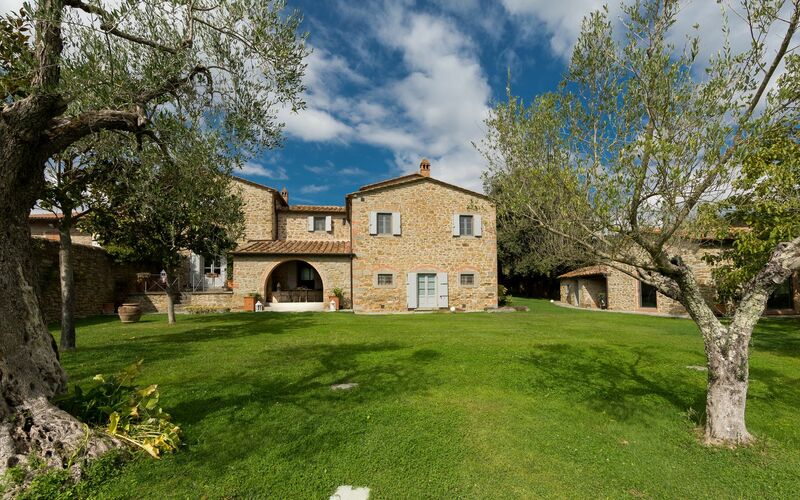 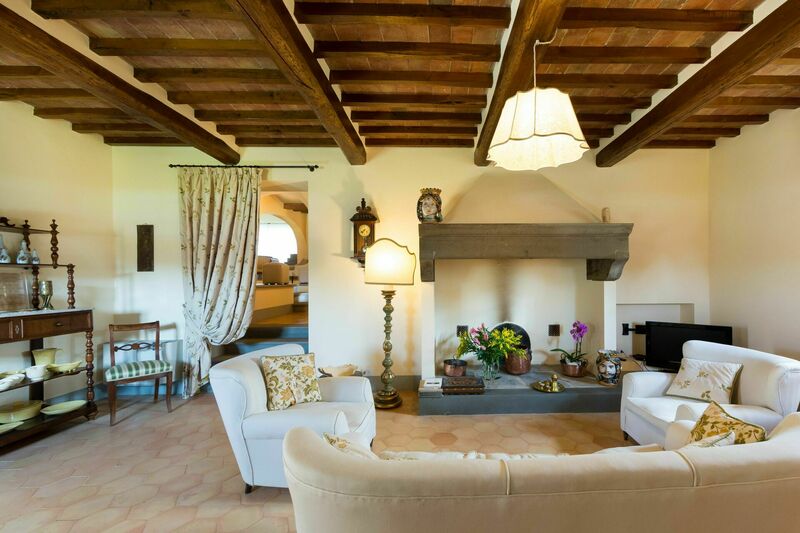 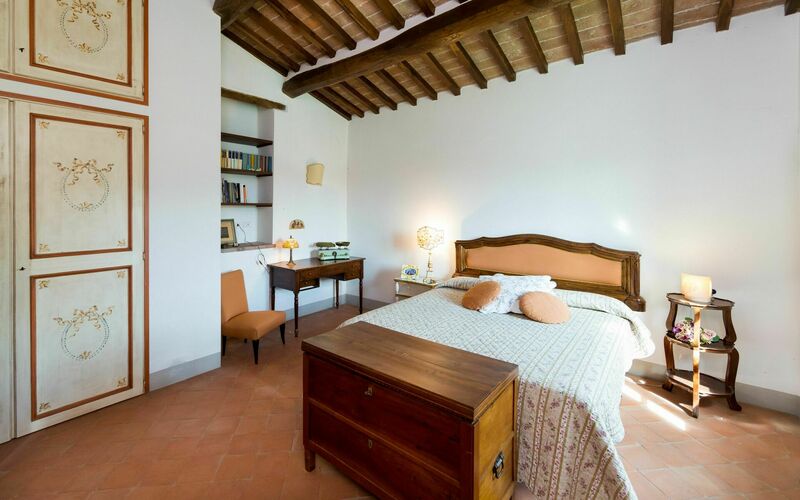 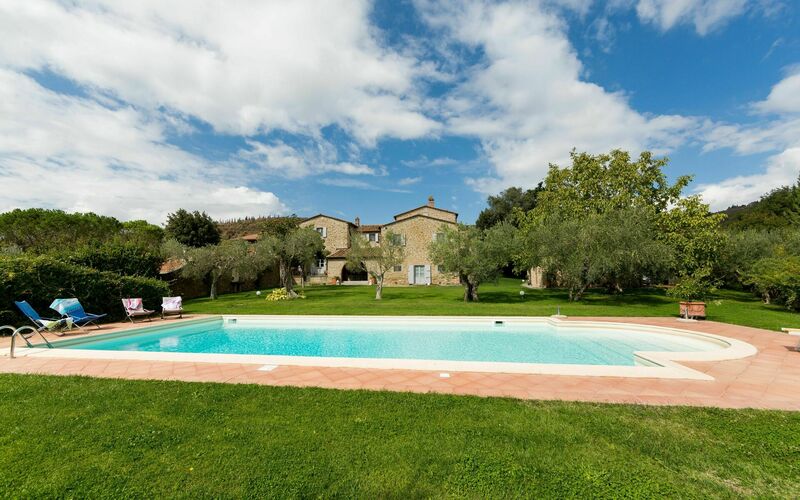 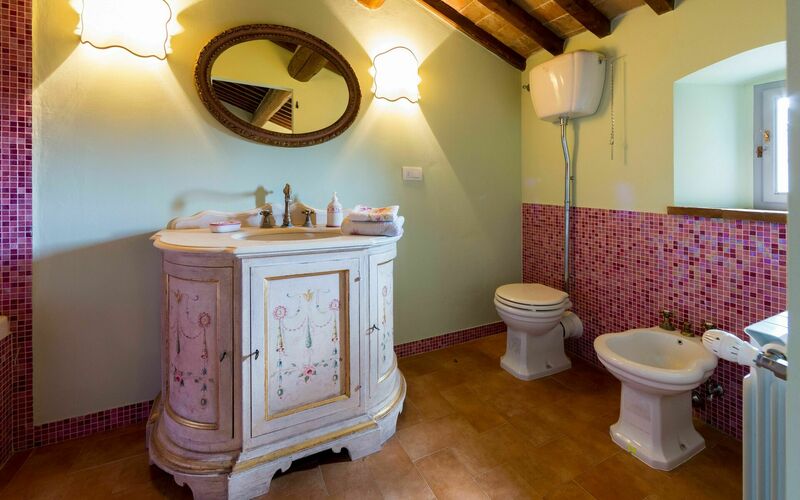 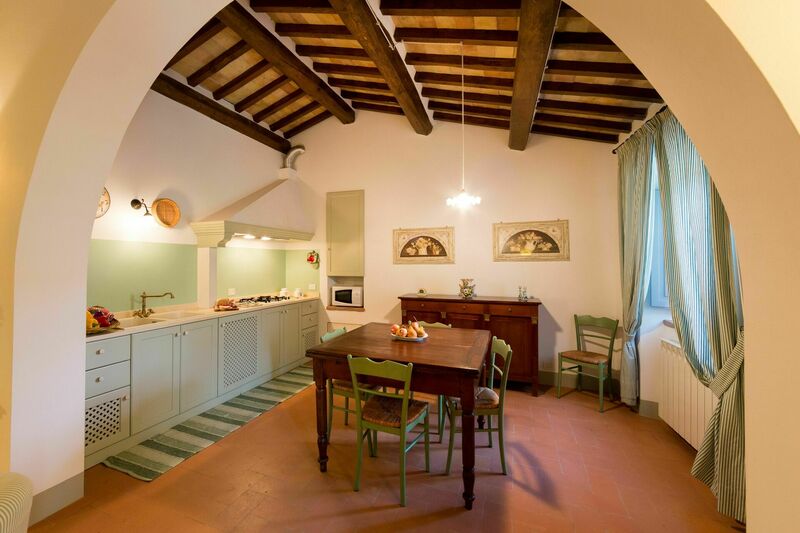 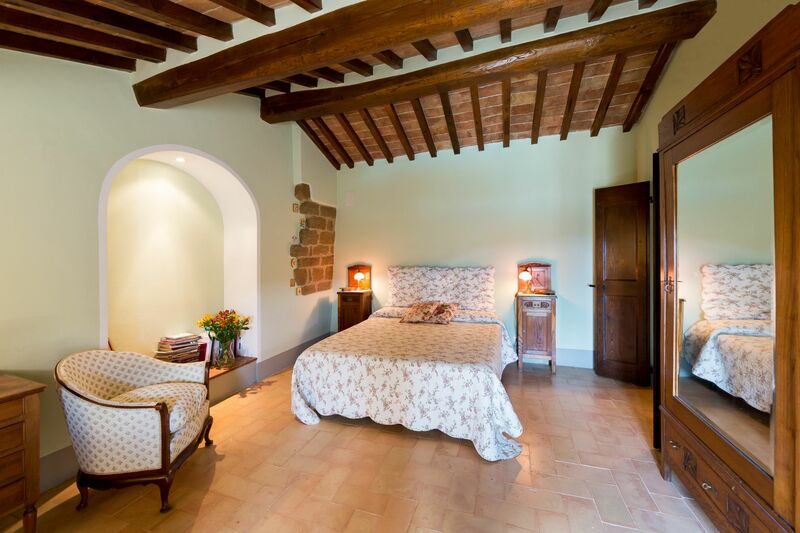 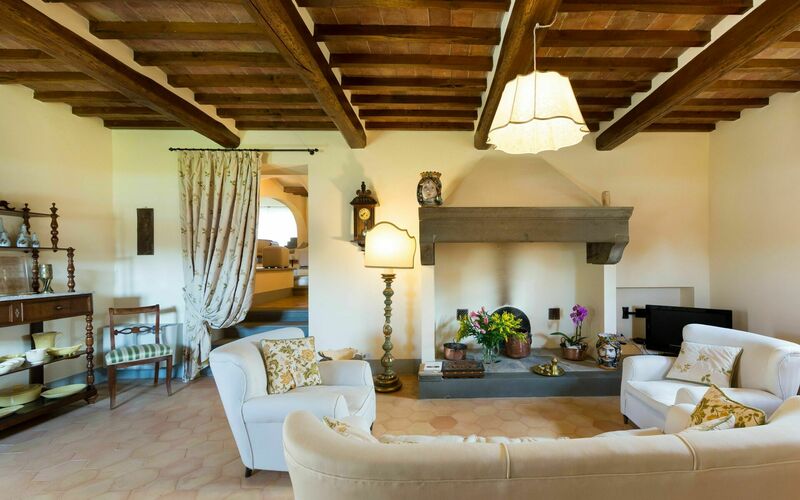 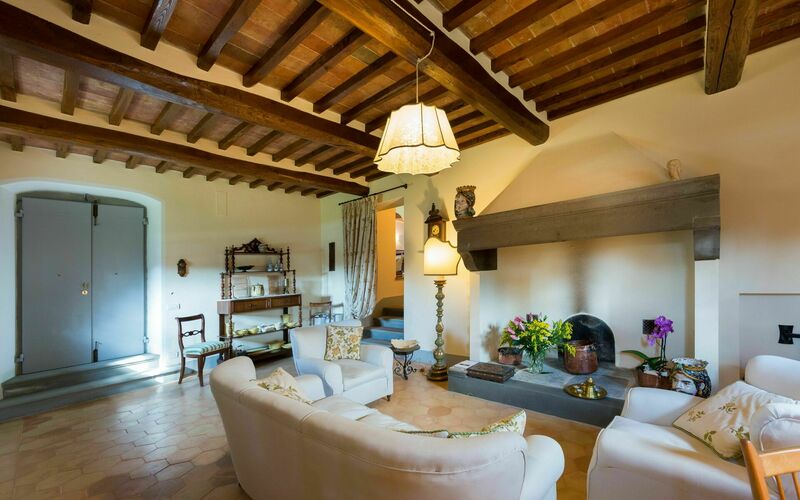 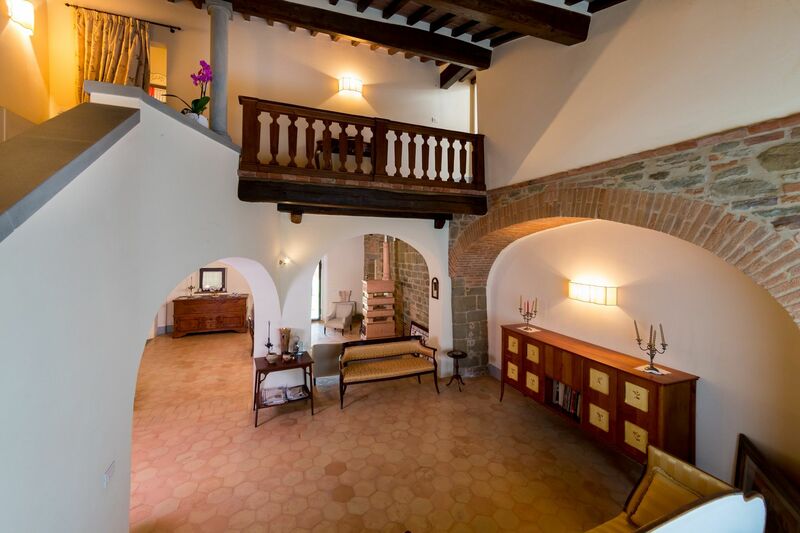 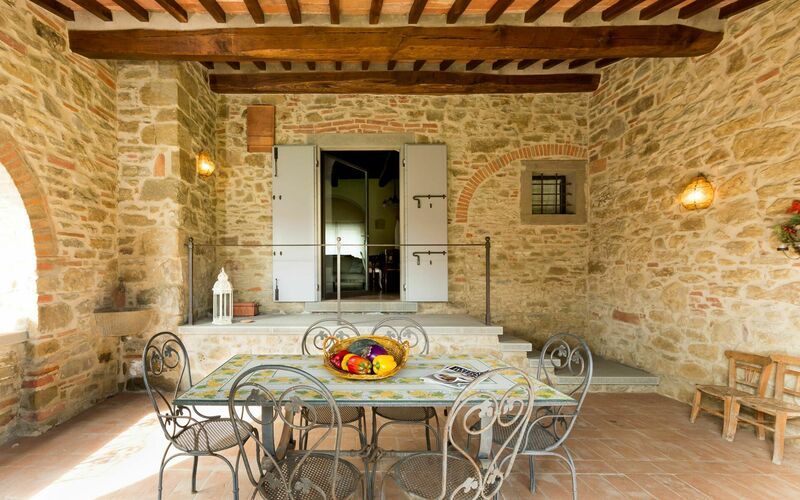 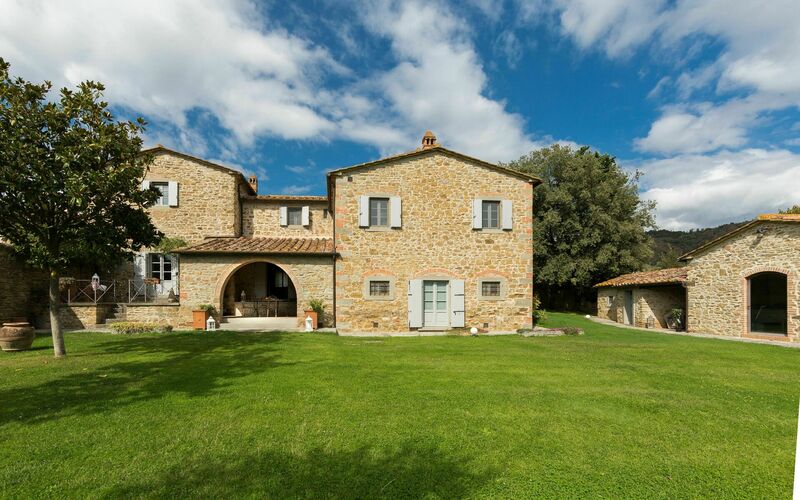 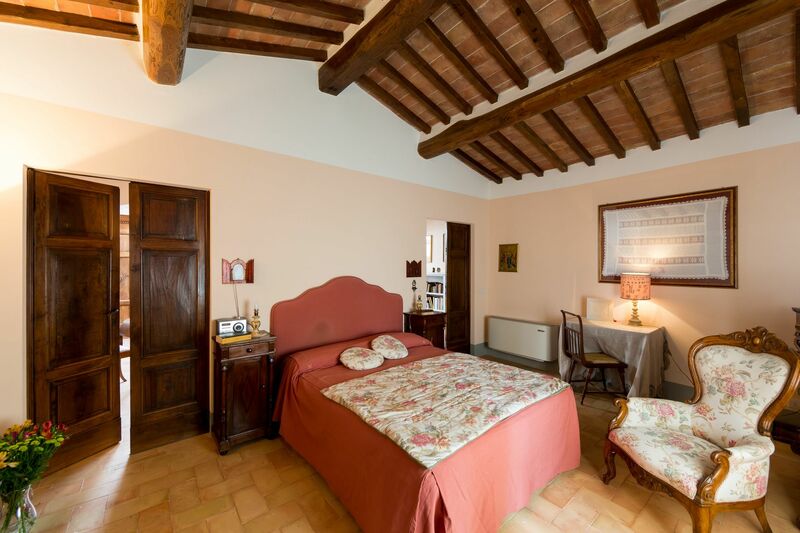 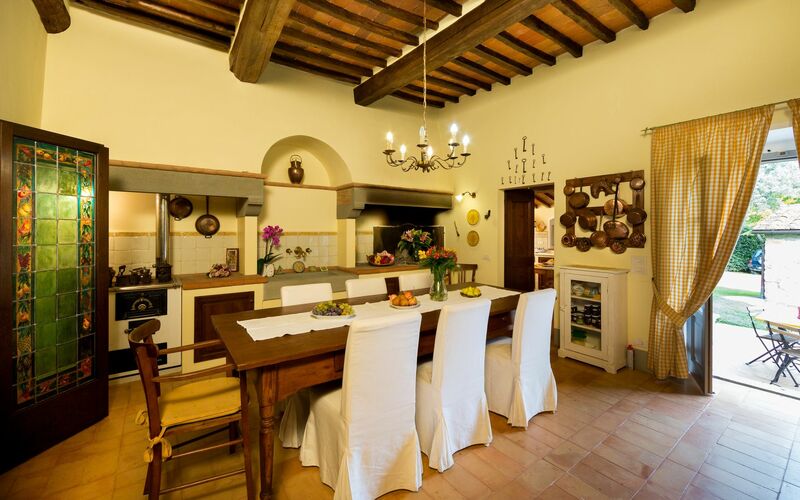 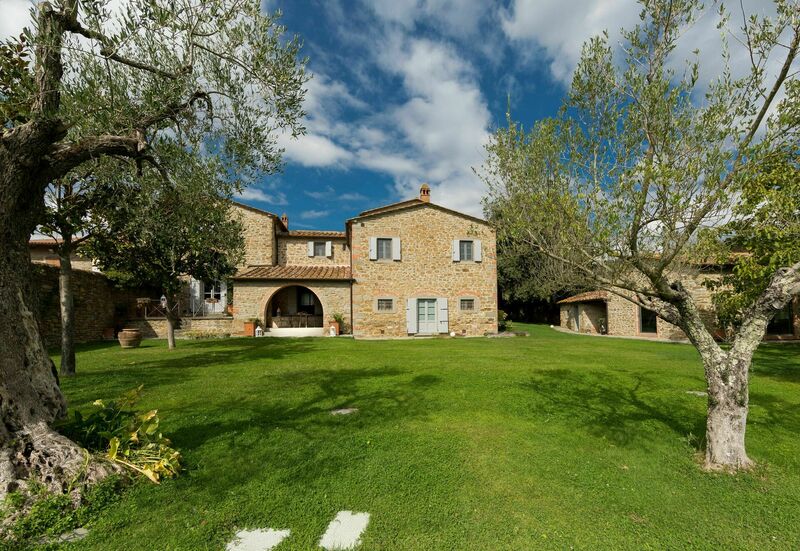 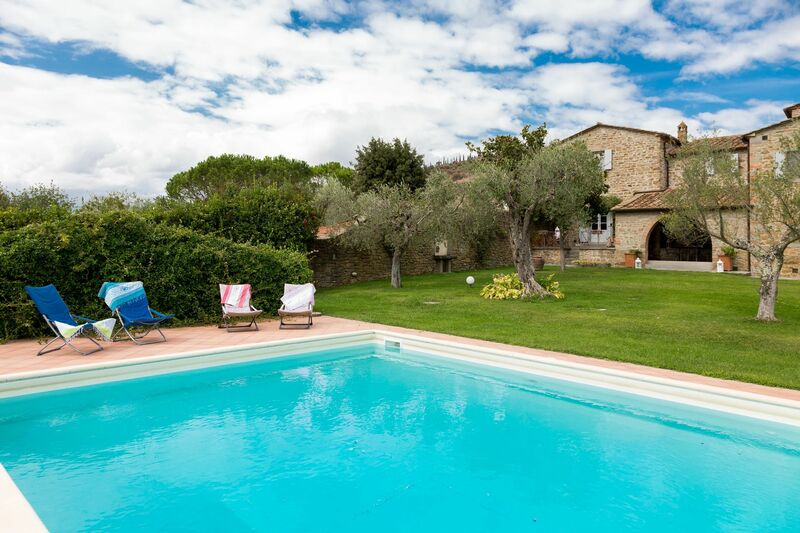 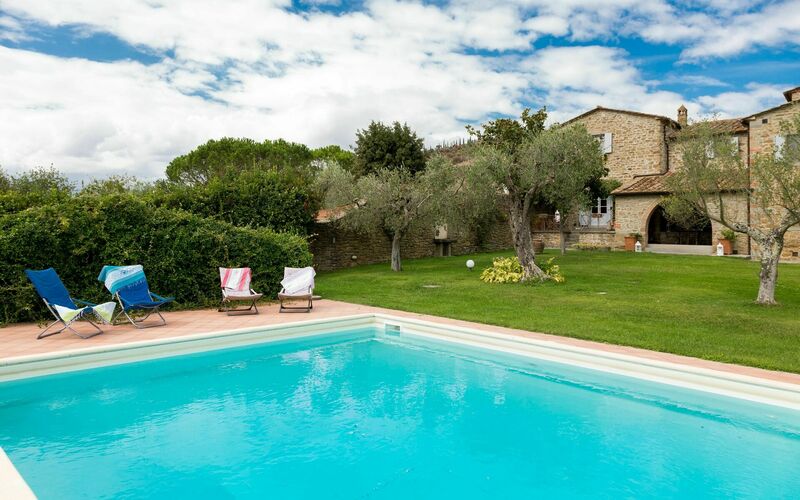 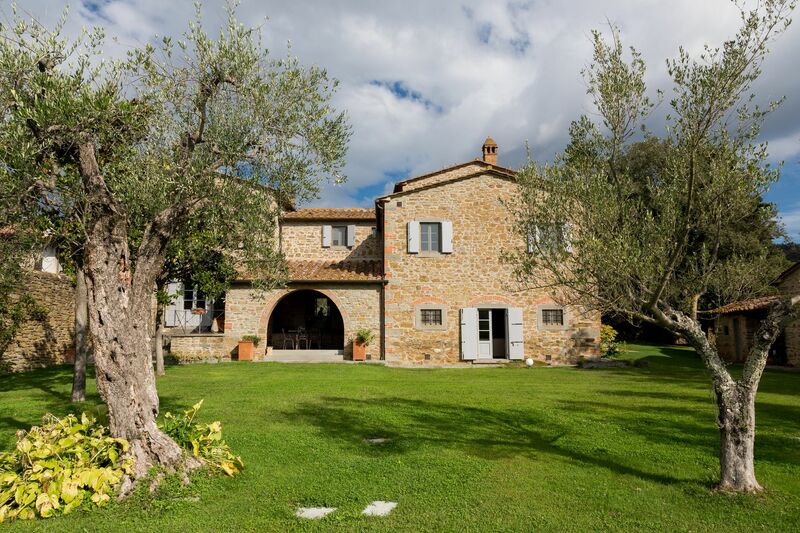 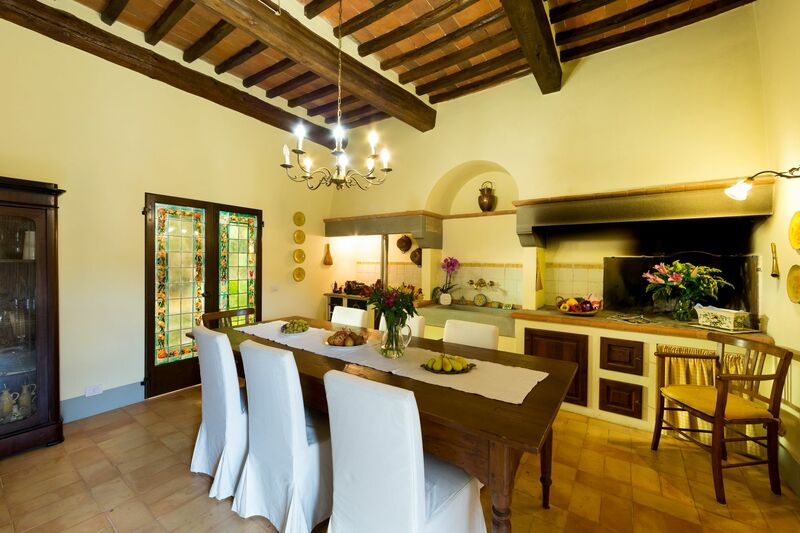 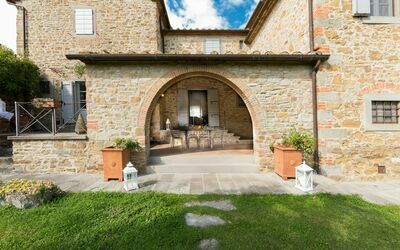 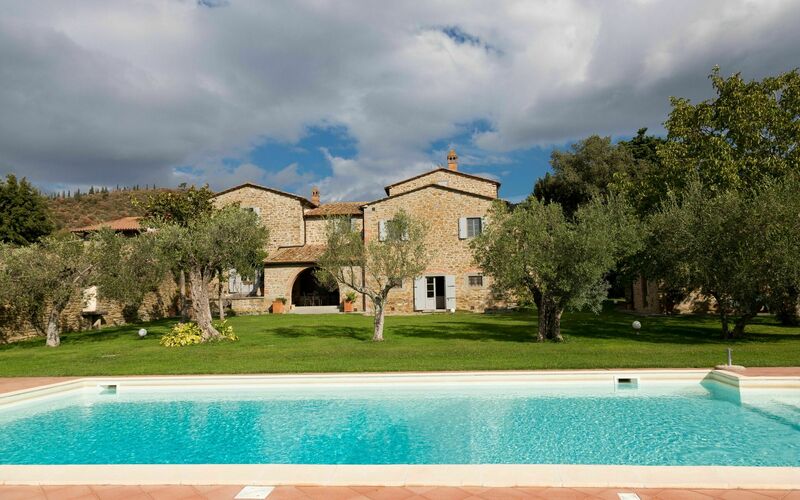 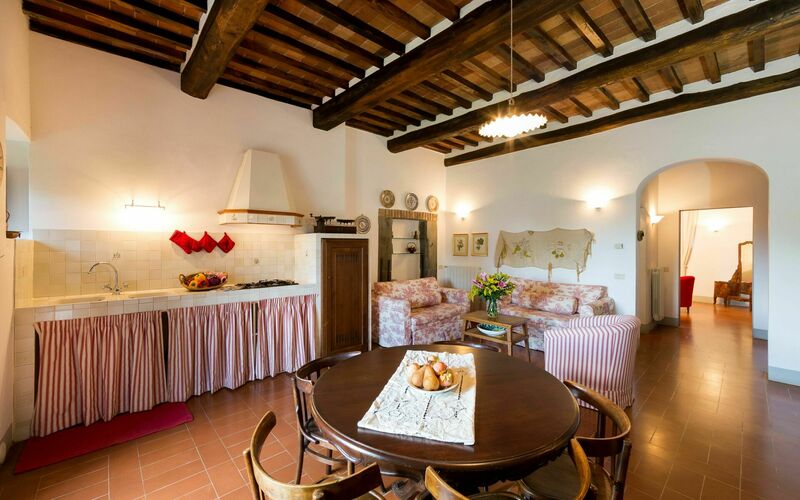 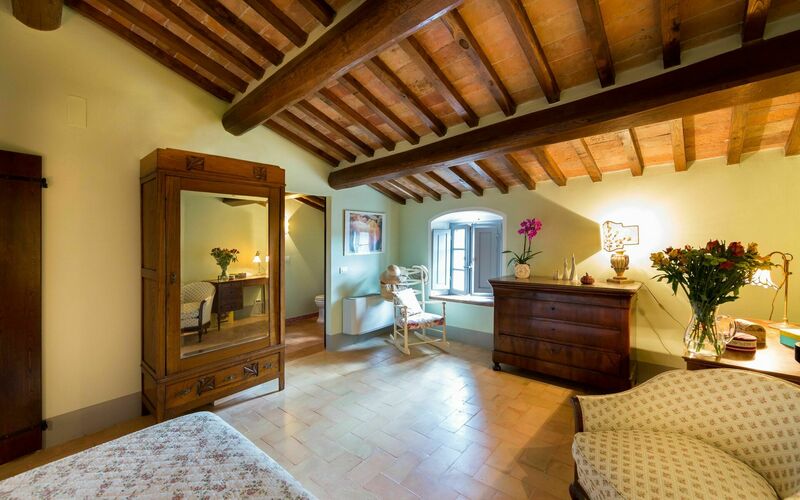 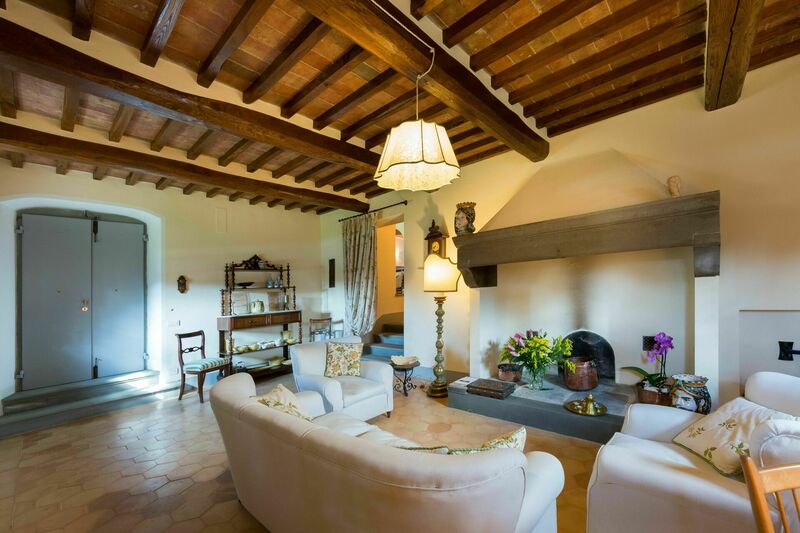 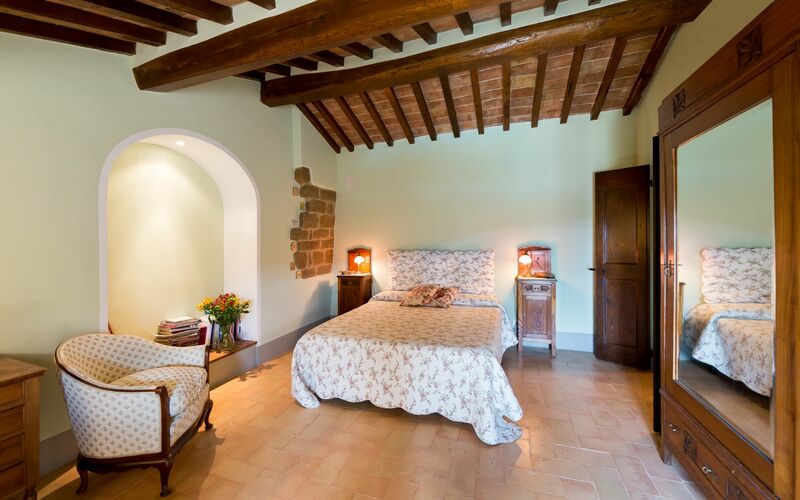 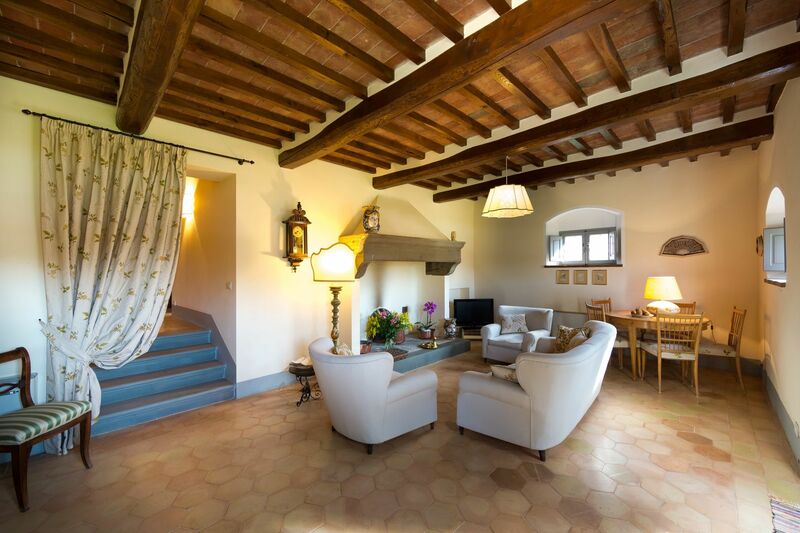 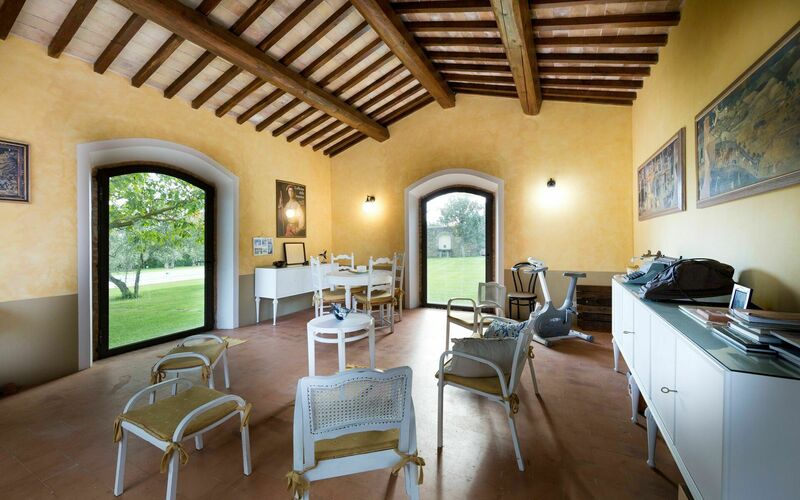 A serene corner of the Tuscan countryside, this villa is the perfect place where to revive and restore, with a large swimming pool, barbecue area and pergola dining area. For maximum convenience, an annex near the pool includes a bathroom with shower and a laundry room. During hot summer days, guests can relax underneath the shade of centenary olive groves and wisteria trees or sunbathe by the pool. 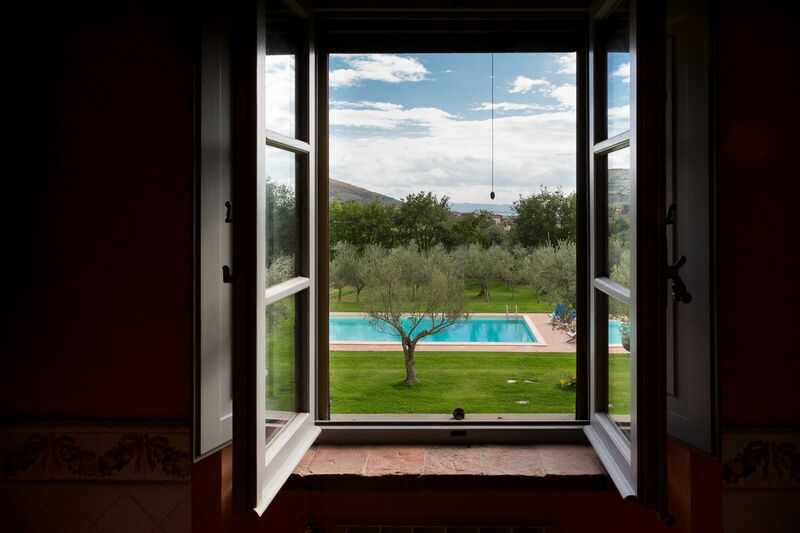 Guaranteeing the utmost peace and privacy, the villa grounds cover almost 800 square meters, including a fruit grove, a vineyard and a vegetable patch. 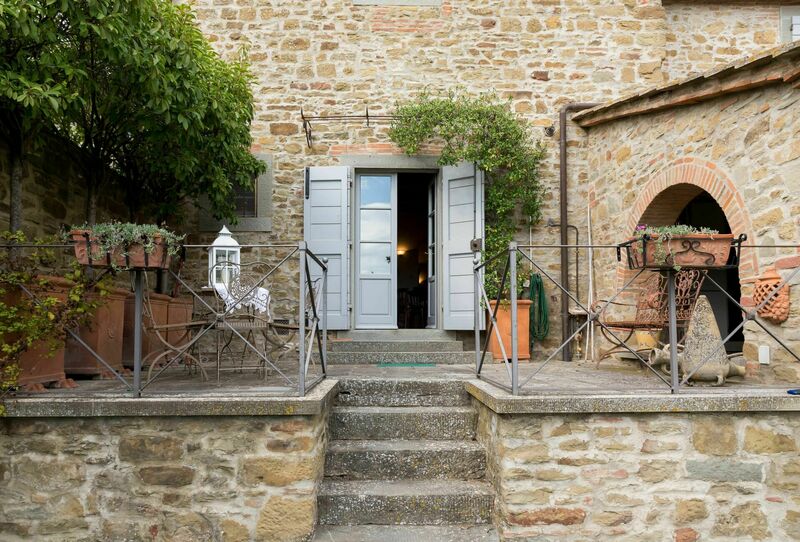 1 km from Camucia is the picturesque town of Cortona, made famous by the movie ‘Under the Tuscan Sun’. 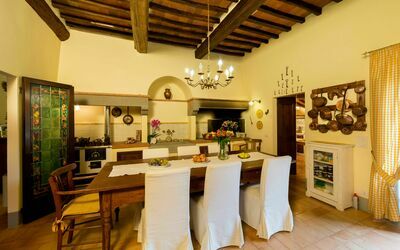 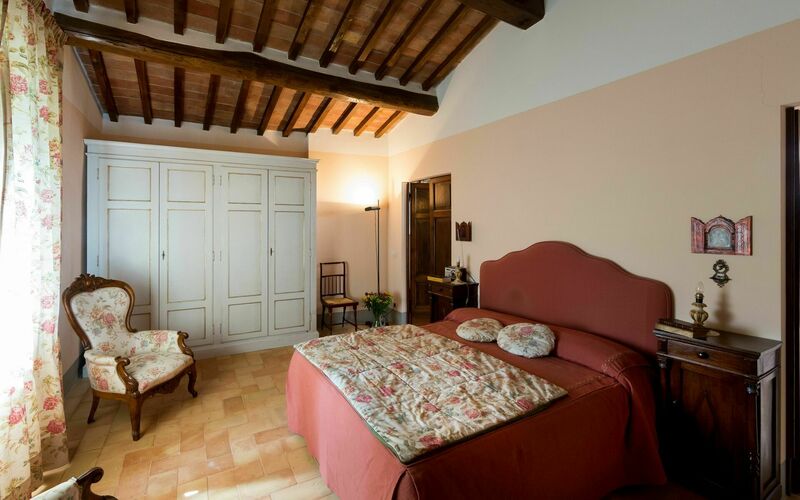 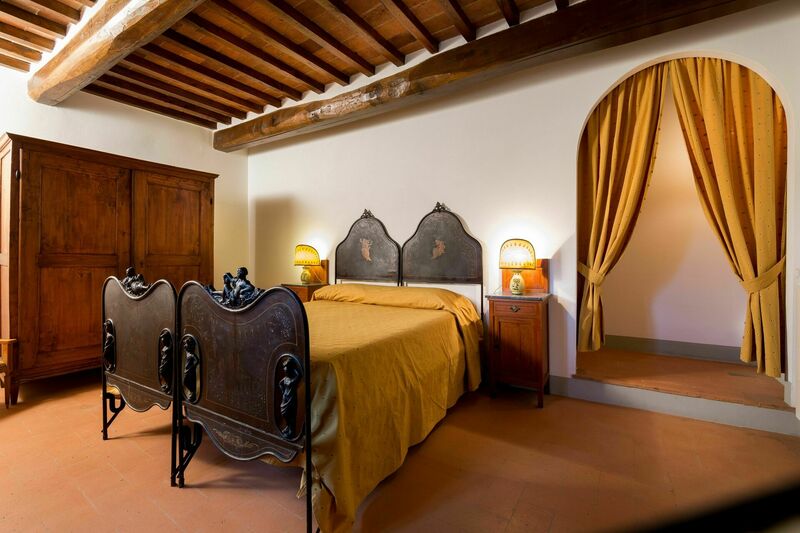 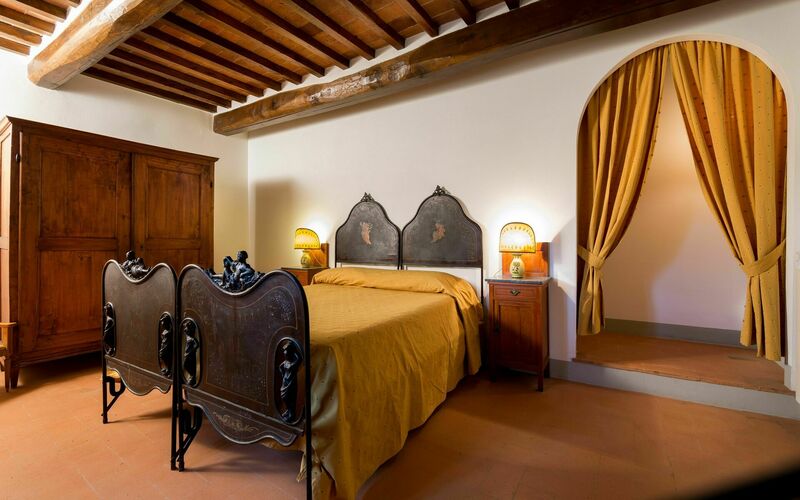 Perched on a hill overlooking the Valdichiana valley, this beautiful medieval town is rich in history and art, but also excellent restaurants, cafes and ice-cream parlors. In Terontola, only 2 km away, there are a small supermarket, ATMs, petrol stations, the post office and a train station (Terontola-Cortona). 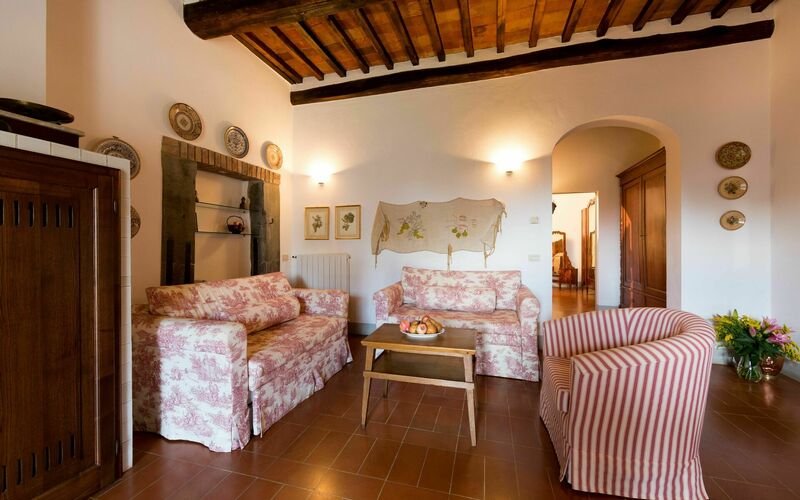 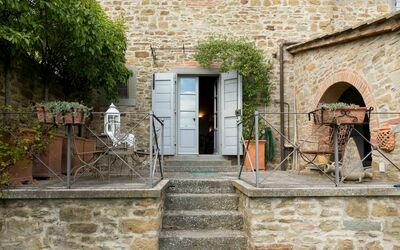 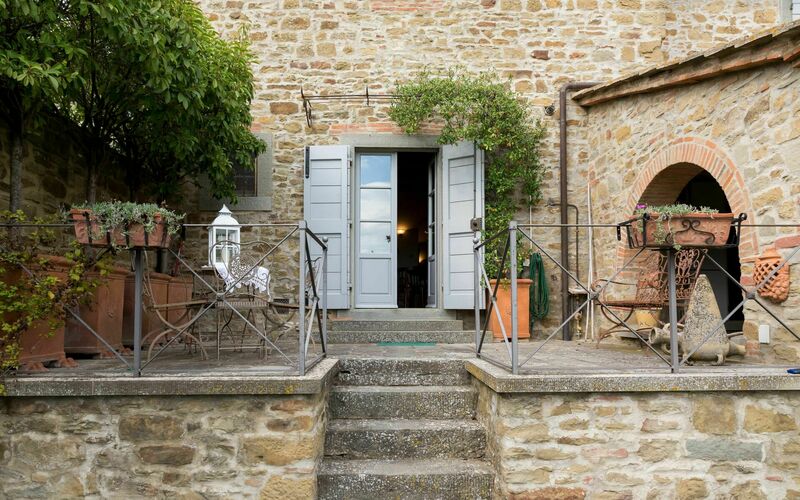 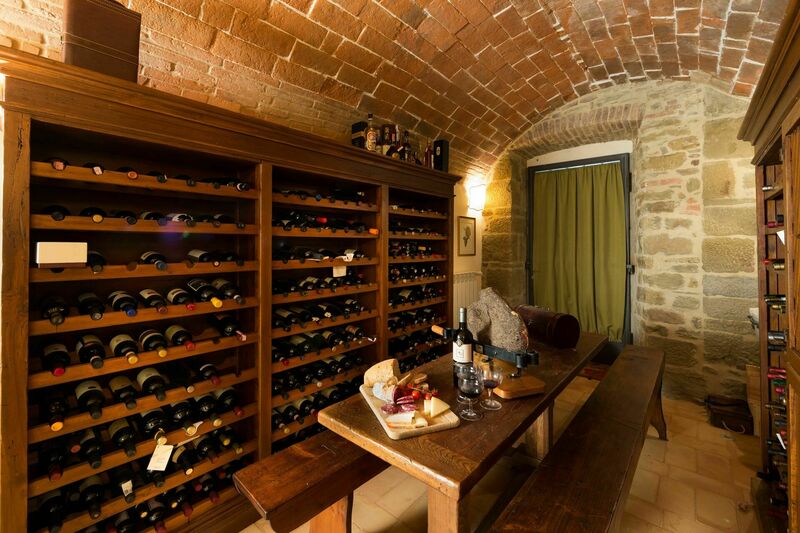 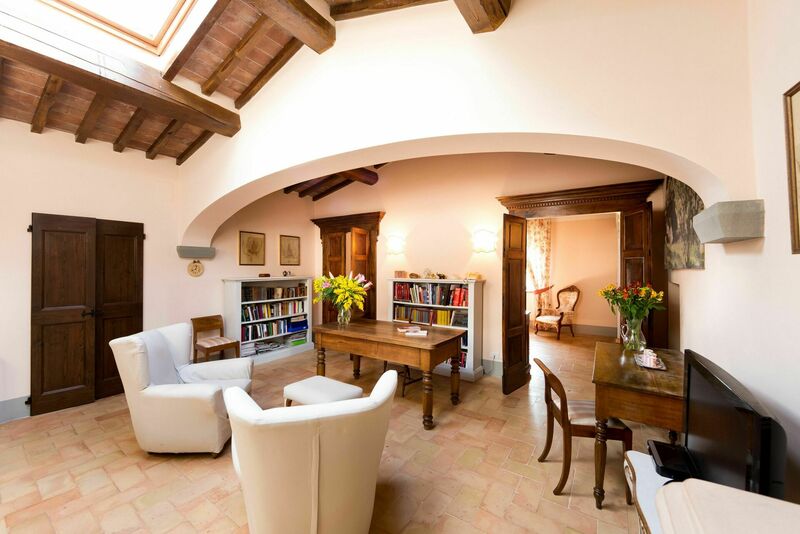 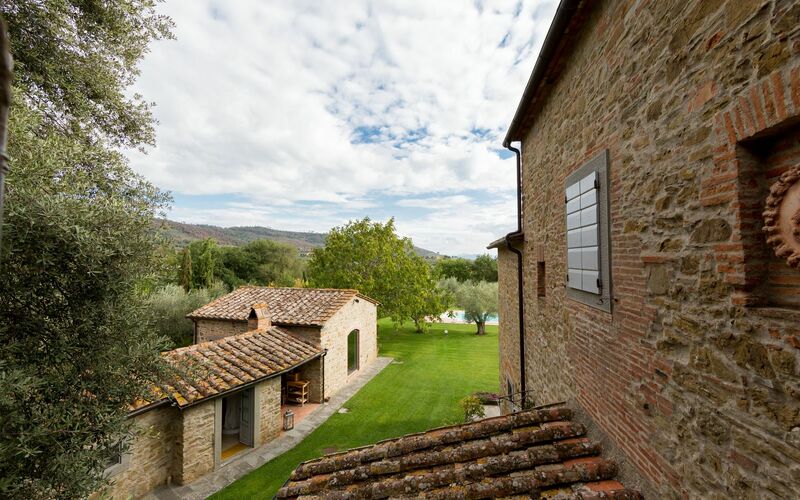 The Together in Tuscany offices can also be found here. 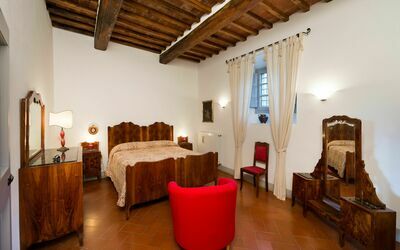 Airports: Florence 1h30;- Rome 2h; - Pisa, about 2h20. The property’s main building, the Villa, is laid out on 2 levels. 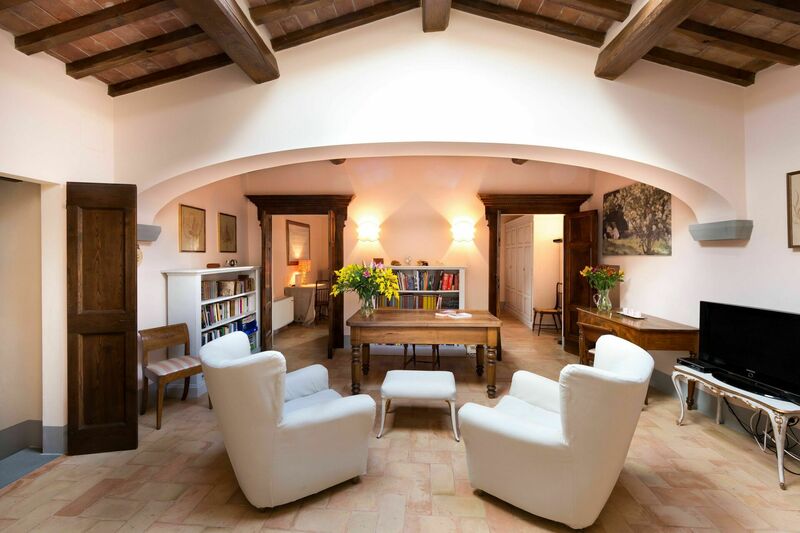 On the ground floor, 2 living rooms are joined by a fully-equipped kitchen, a dining room and a bathroom. Wine-lovers will appreciate the cellar, also located on this floor. 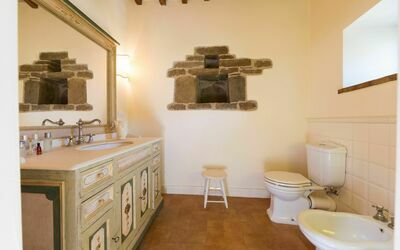 Indoor-outdoor living comes with the territory in Tuscany and Villa Conti was restored to allow guests to enjoy its lovely garden. Accessible from both the living room and the dining room, two well-appointed patios, both furnished with dining tables, are perfect for al fresco meals. 15 steps lead to the spacious first floor, where the bedrooms are located. 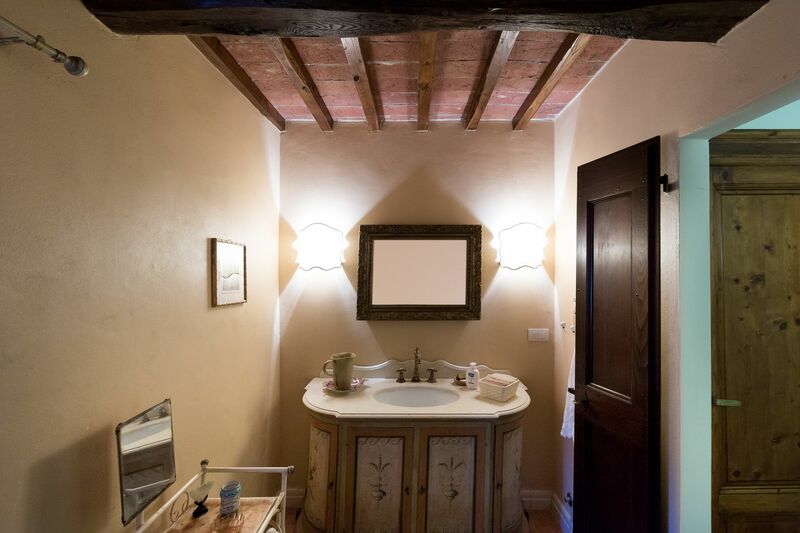 In the west wing, a living room complements a double bedroom and two bathrooms, one with a bathtub. 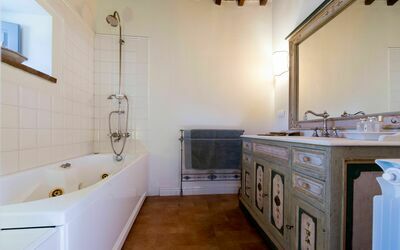 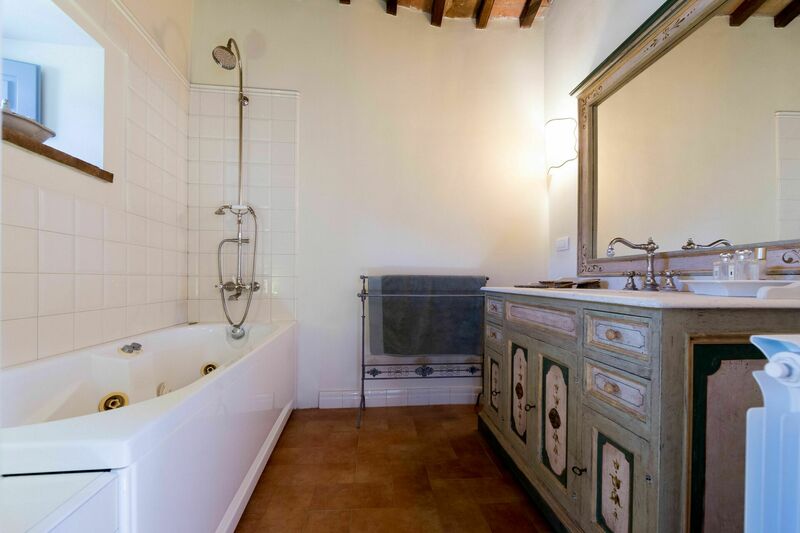 In the east wing, there is a double bedroom with en-suite bathroom, complete with bathtub. Still on this floor, another double bedroom and a bathroom with shower. 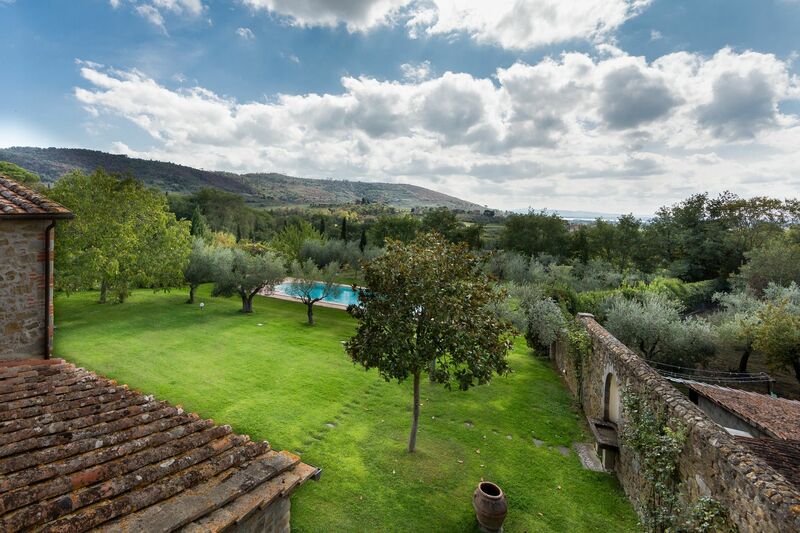 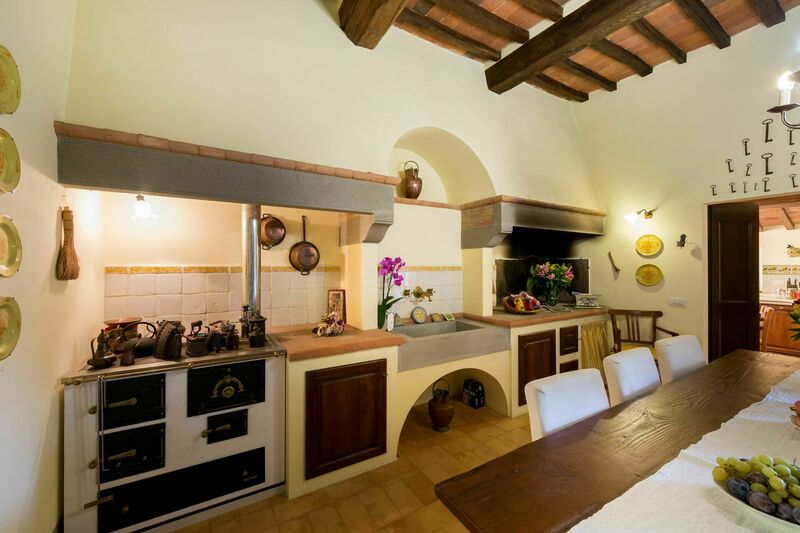 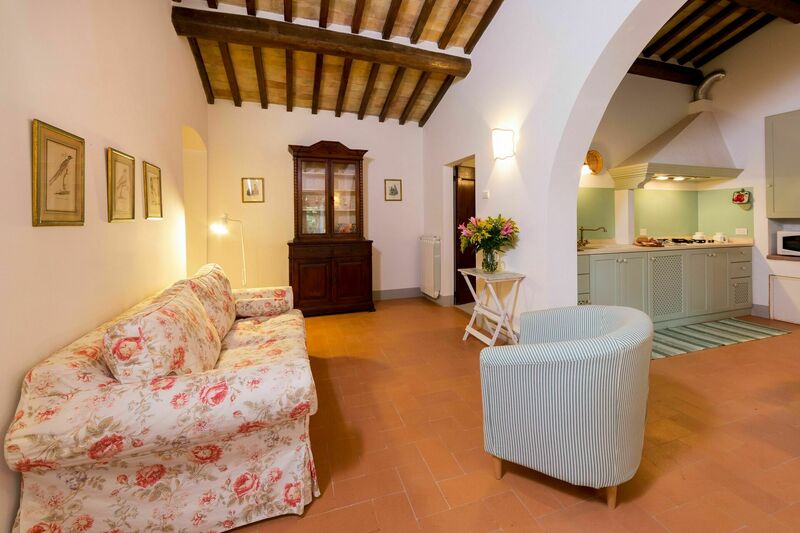 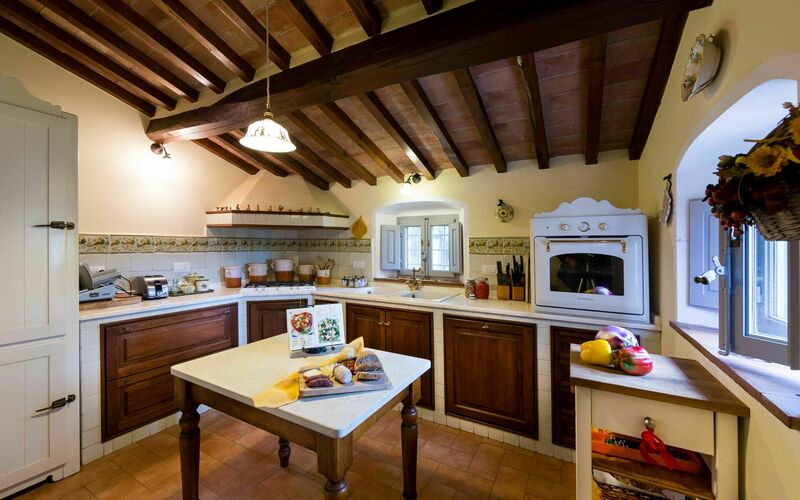 All 3 bedrooms enjoy stunning views of the garden and the surrounding olive groves. 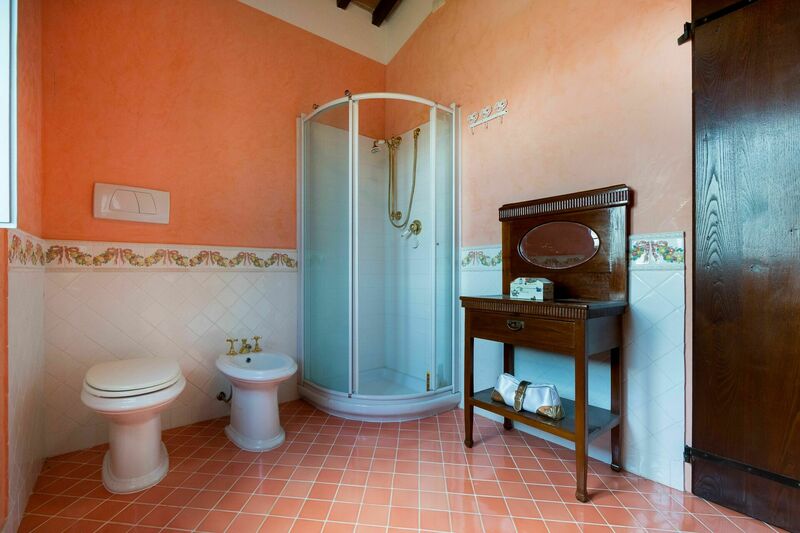 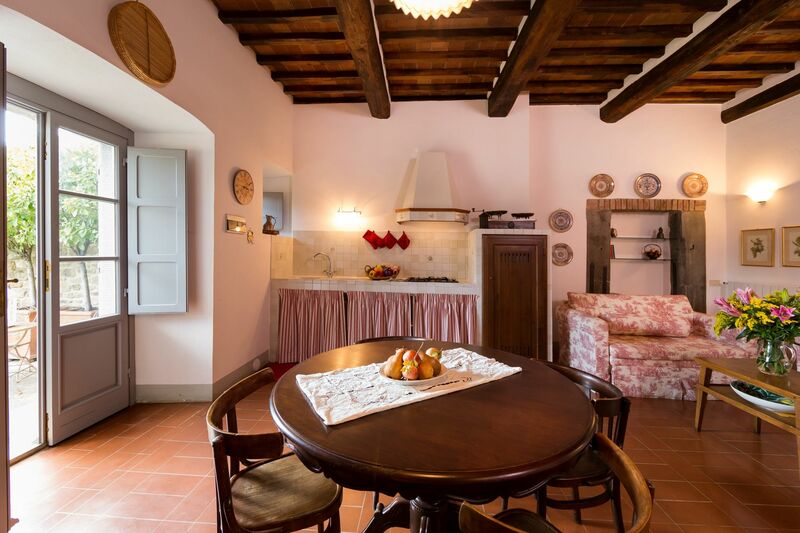 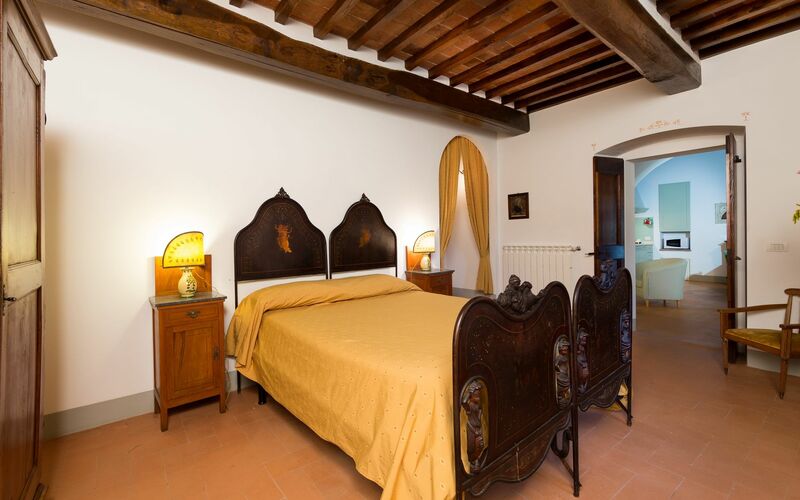 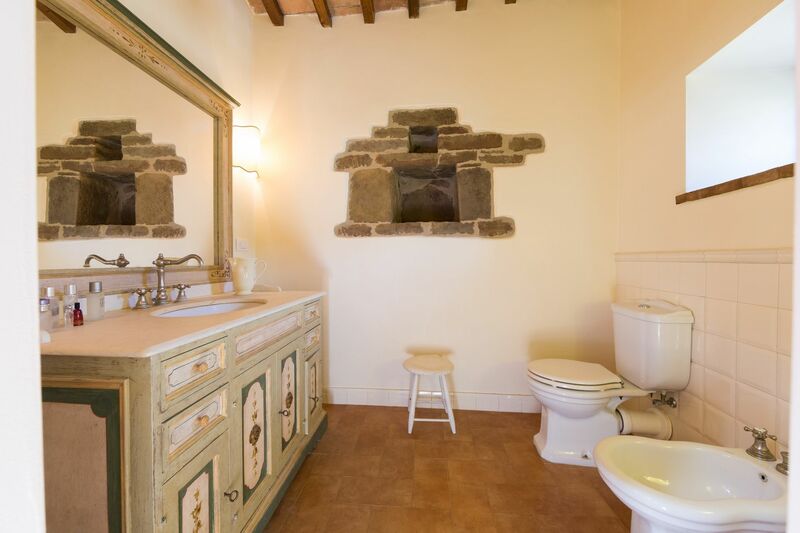 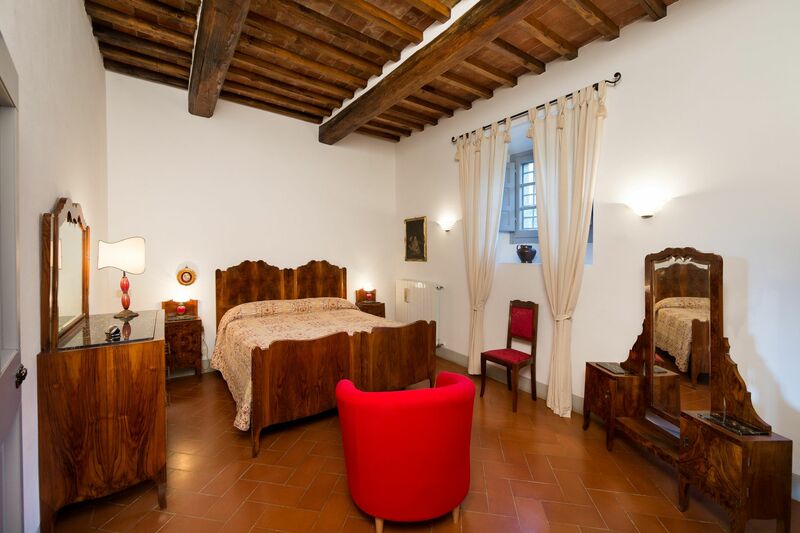 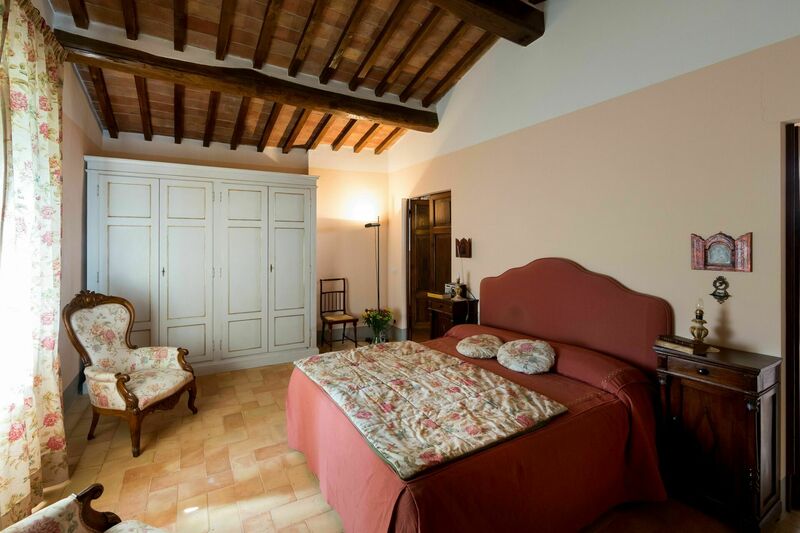 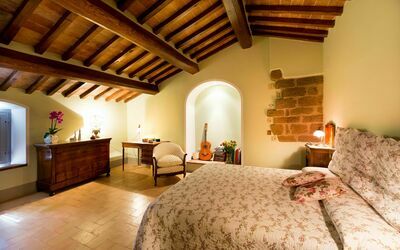 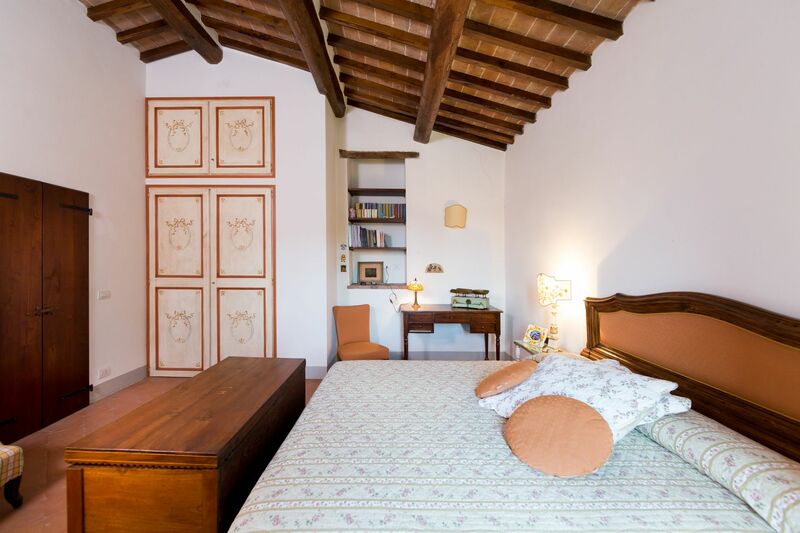 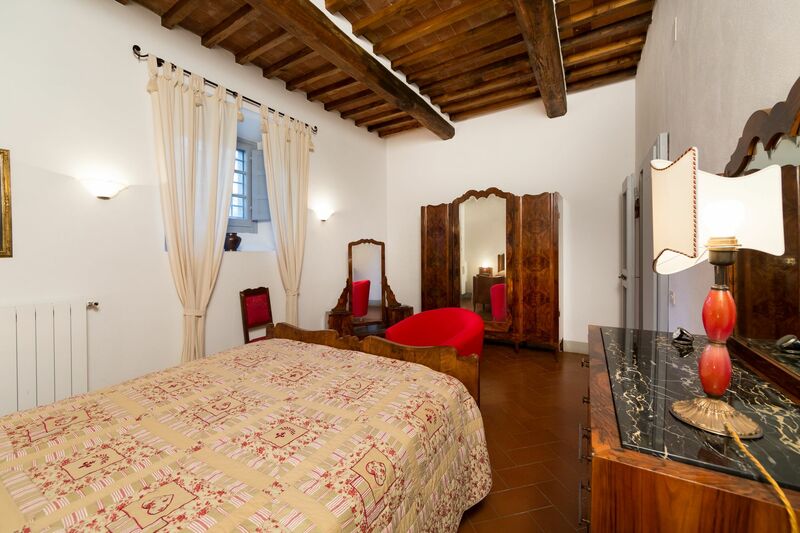 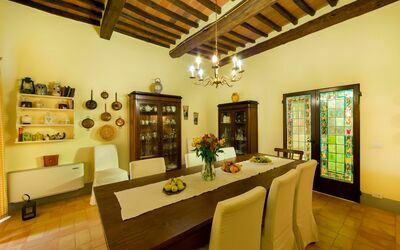 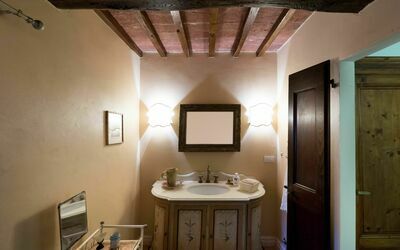 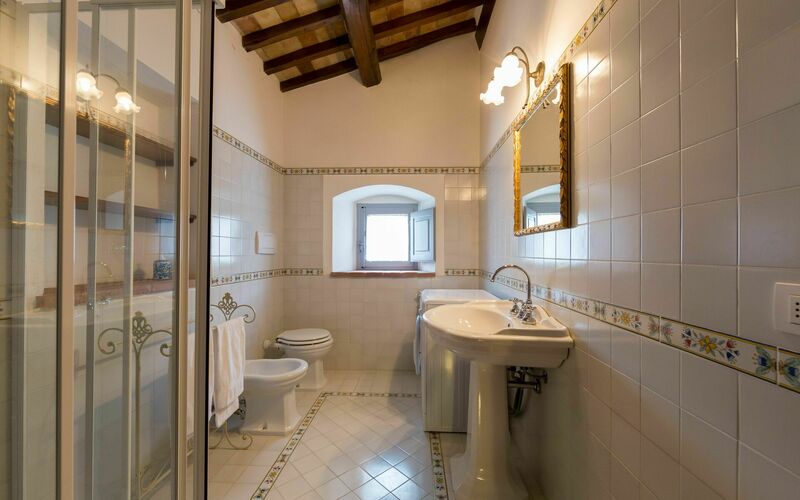 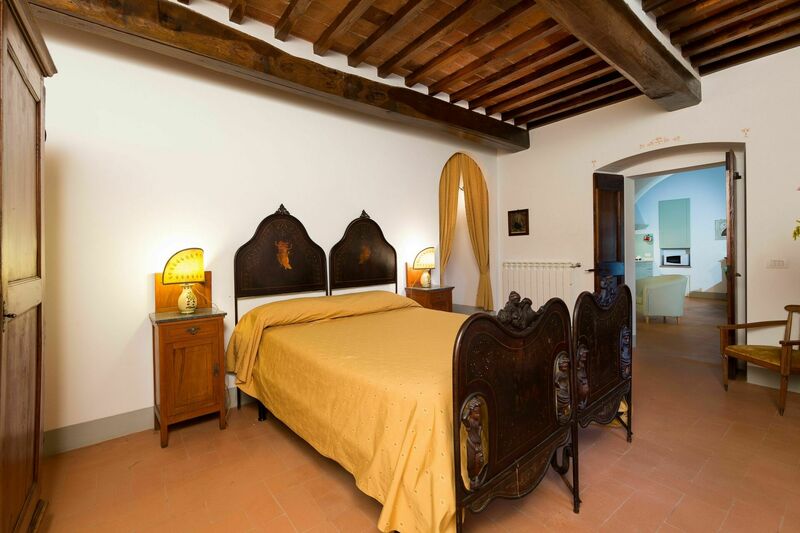 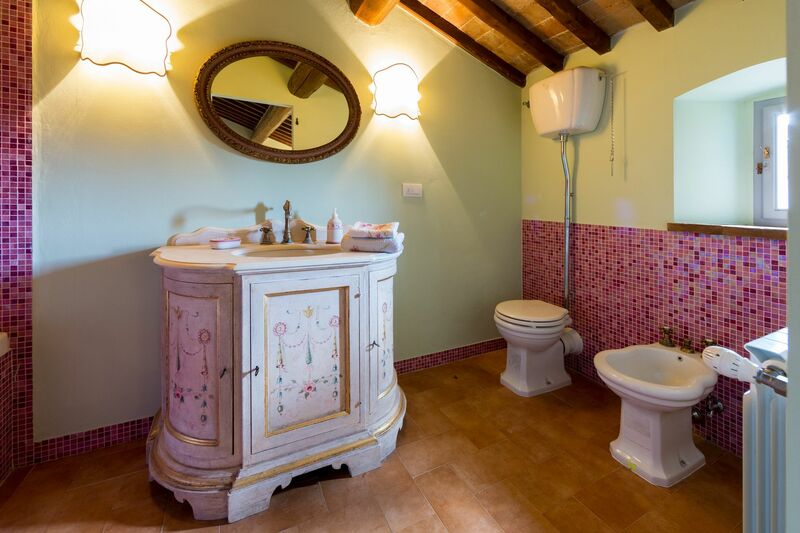 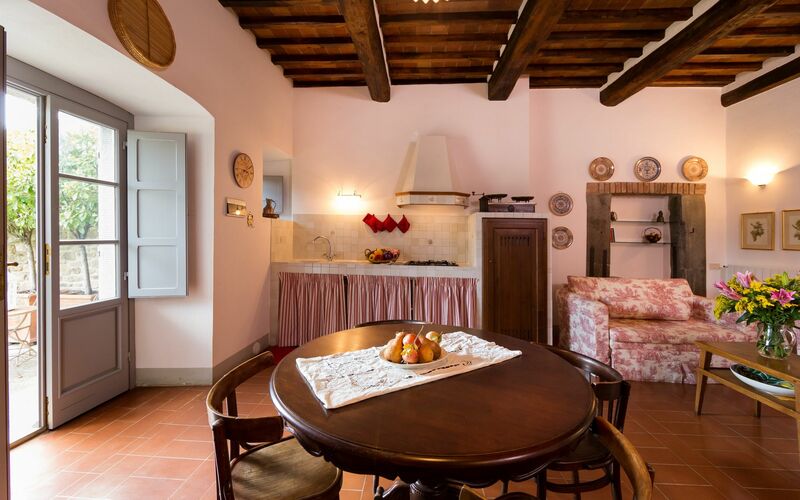 The Tower, a few meters from the Villa, hosts a self-contained apartment with its own private entrance. Comprising of a living room and kitchen, a double bedroom and a bathroom with shower, it offers beautiful views of the garden and olive groves. 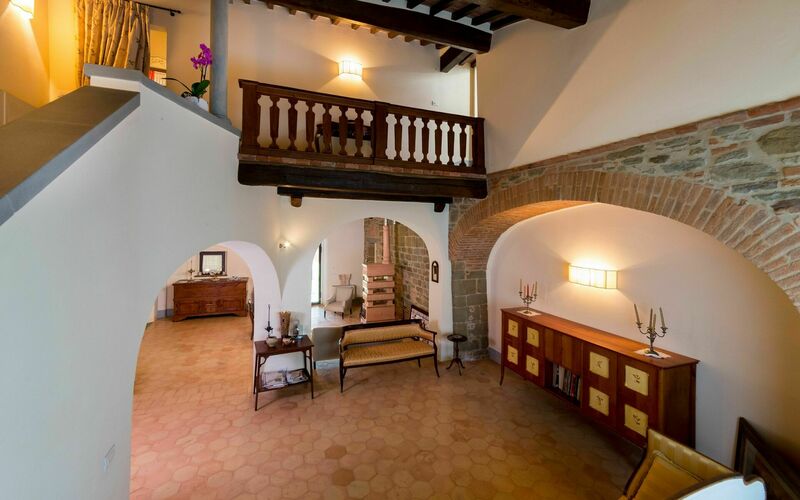 The apartment has a total surface of 75 square meters and is accessed by a 15-step staircase. 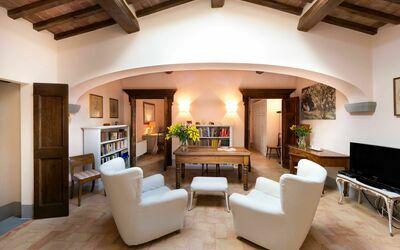 The Terrace is the second self-contained apartment on the property. 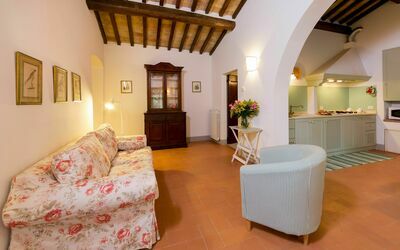 Accessed from the garden, it consists of a living room and kitchen, a double bedroom and bathroom with shower, all located at ground-level. The well-appointed apartment takes the name from its delightful terrace, the perfect spot for relaxing.